Our range of LED Step lights for indoor and outdoor use. 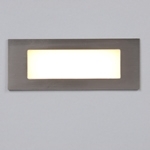 All these fittings provide a great efficient lighting effect on stairways, hallways, living rooms,kitchen plinth lighting, some suitable for outdoor use e.g. for lighting garden pathways.